Estella Gonzalez was born and raised in East Los Angeles, which inspires most of her writing. 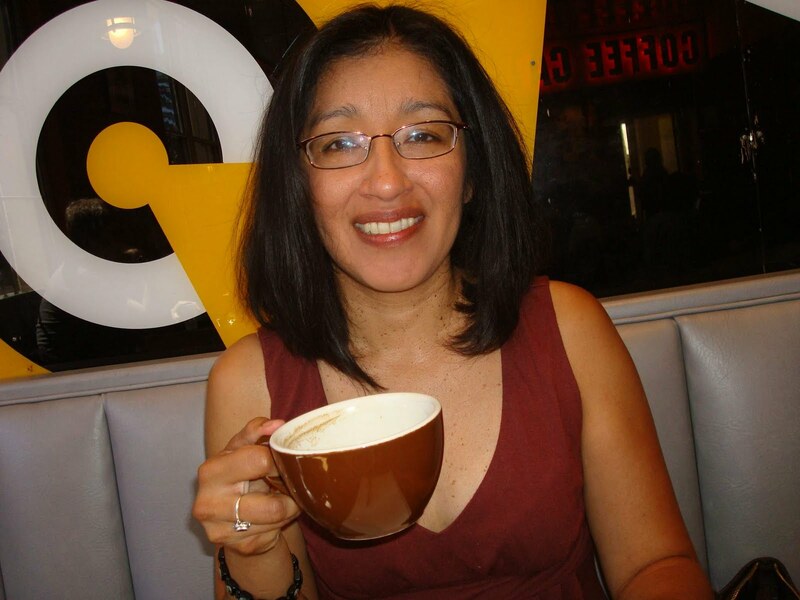 Her work has been anthologized in Latinos in Lotusland: An Anthology of Contemporary Southern California Literature published by Bilingual Press and Kaleidoscope published by Pima Press. Her writing has also appeared in Puerto del Sol, Sandscript and Eleven Eleven. Back in the 80s I knew I wanted to become a writer when my high school’s literary magazine published one of my stories. It was called “The Brotherhood” and it was about a girl who wanted to infiltrate her crush’s group of male friends so badly, she actually became a boy. Very corny but seeing the story in print and appreciated by my teachers boosted my confidence. Still, I wouldn’t seriously consider pursuing fiction writing until about 15 years later when I finally built up the courage and confidence. For many writers the decision to commit to writing can be harrowing, especially if you’re a writer of color from a working class background. For me it was particularly scary since I didn’t personally know any active Chicano writers and wouldn’t read any Latino literature until well after college. Becoming a writer, a real published writer, seemed like a pipe dream but despite the self-doubt I began writing in earnest and eventually publishing. Flash forward to 2010 and WriteGirl, a Los Angeles-based volunteer mentoring organization I wish had existed back when I was in high school. WriteGirl provides high school girls a safe, supportive community to express themselves through the exploration of writing including poetry, journalism, songwriting, screen writing, etc. I found this wonderful organization on the Internet when I was looking for a Latina writing group close to East Los Angeles. Little did I know that WriteGirl would offer a writing group and then some. About once a month I not only get to participate in writing workshops with a group of professional writing women, I also get to mentor enthusiastic high school girls, many of whom are Latina and African-American. And WriteGirl doesn’t mess around. 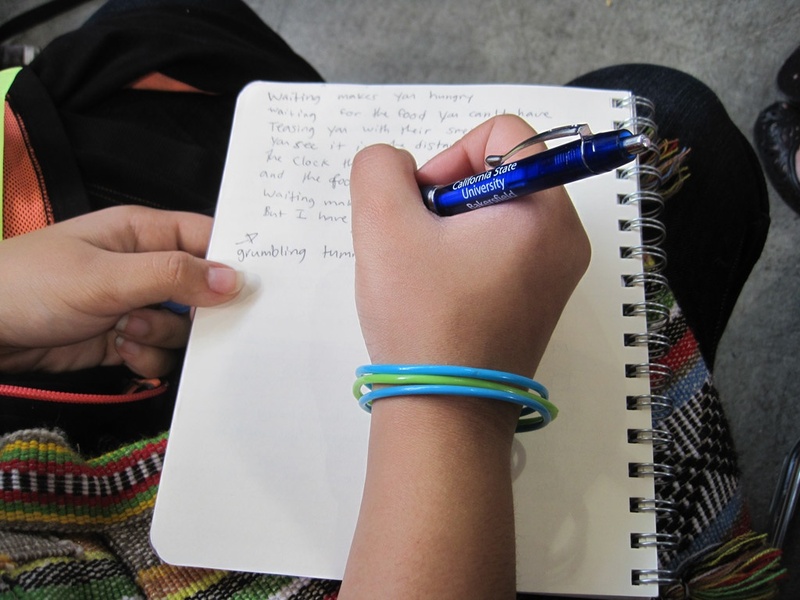 At the organization’s first poetry workshop held at the Miguel Contreras Learning Center, writing began as soon as the girls walked in to the writing space. In this case the cafeteria. After signing in, the girls quickly partnered up with their mentors to write haikus on various topics including love, family, and hunger before they went on to join larger groups of writers to create living tableaus of their poetry. After the group performance, local Angeleno poets Xotchil-Julisa Bermejo and Eloise Klein Healy led us on some invigorating poetry exercises. It was the first time in years that I had written some meaningful poems. Founded by songwriter, poet and freelance writer Keren Taylor, WriteGirl is an activist feminist writer’s dream. 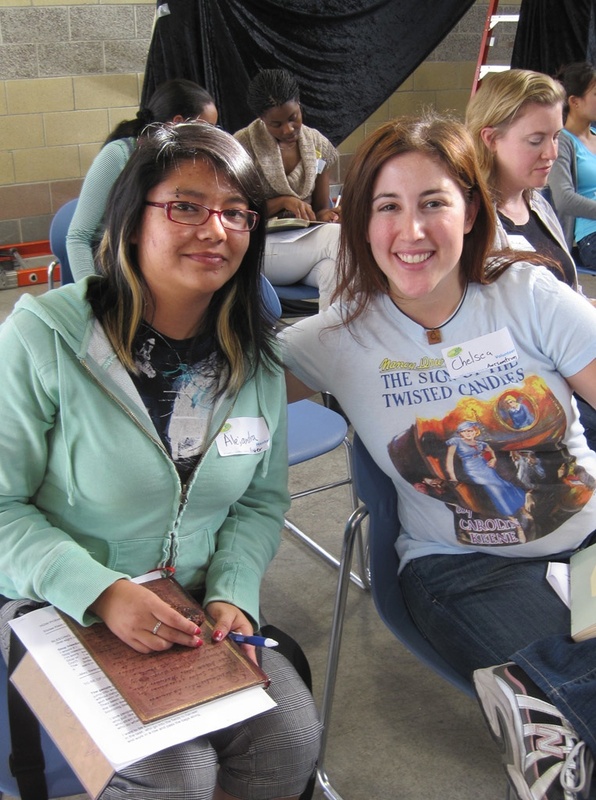 In addition to participating in once-a-month writing workshops, WriteGirl volunteers can also mentor during weekly one-on-one writing sessions or assist the In-Schools program coordinator with creative writing lessons at one of the six Los Angeles County alternative schools. Or they can do both if volunteers are so inclined. And did I mention that there is no cost to the girls or volunteers? Everything is paid for through grants and donations. In many of these young women, I see younger versions of myself. Last month I started mentoring Eva Robles, a Latina high school freshman from South Los Angeles who, if everything goes according to plan, will be the first in her family to graduate from high school and college. She and her sister Melanie were born in California and are second generation Americans whose parents immigrated from Mexico. They live in the working class city of Southgate. 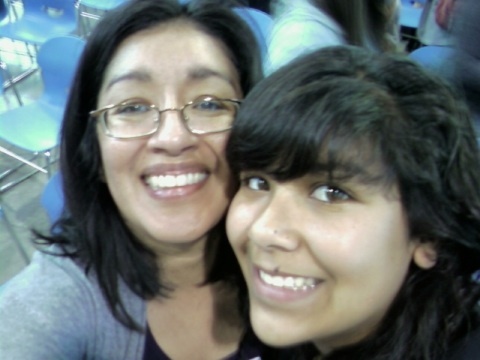 Her family situation practically mirrors my own, except that I grew up in East Los Angeles. I’ve been meeting weekly with Eva to write about family, celebrations and, my favorite, food and it’s been creatively invigorating. It’s only been a month but I look forward to our meetings since sometimes it’s the only creative writing I get done for the week. 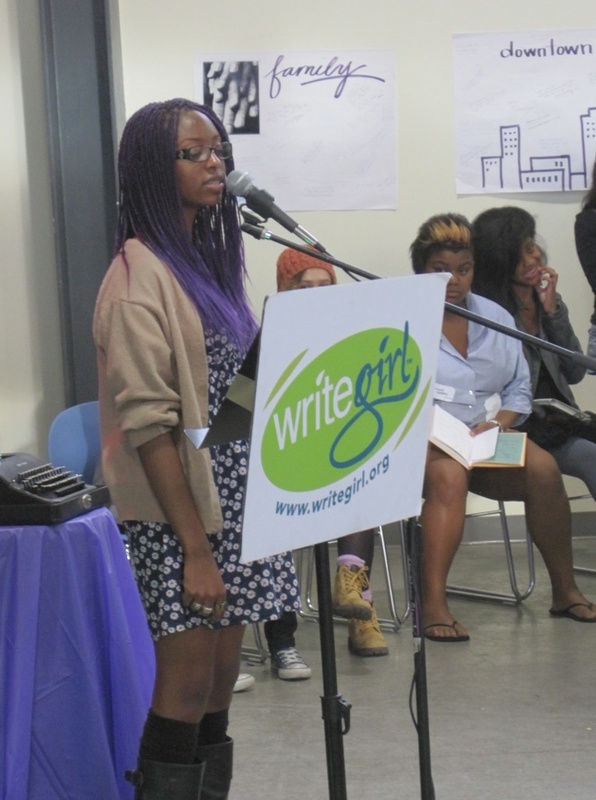 Besides encouraging the exploration of writing, WriteGirl’s other main goal is to prepare these girls for college. According to Ms. Taylor, 100 percent of the girls who go through the mentoring program go on to graduate high school and attend a post-secondary institution. Ms. Taylor and associate director Allison Deegan, have helped create an invaluable service I wish I had had access to when I was in high school: a college application workshop. Complete with mentors who offer one-on-one assistance, the workshop provides much needed help in filling out application paperwork including personal statements and financial aid forms. This invaluable support system has helped at least one high school senior, Alejandra Castillo, secure a four-year full-tuition scholarship through the Posse Foundation to Kalamazoo College where she plans on studying anthropology. And WriteGirl is not shy about pointing out its college successes. At the poetry workshop, we heard from several WriteGirl alumni who had gone on to major universities such as the University of Southern California and University of California Irvine. One student was a senior who was majoring in journalism and the other a freshman who was studying biomedical engineering. Not too shabby. And both young women emphasized how their WriteGirl experiences, including public speaking, helped them succeed in their academic careers. At the end of the workshop, the girls were asked to come up to a microphone to read poems they composed that day. Some, particularly those writers who were just starting out, were too shy or read in quiet voices. But others, mostly las veteranas, read their work aloud and proud and got the benefit of positive feedback from poet Gail Wronsky and Ms. Klein Healy. Eventually, some of these poems will be published in a book. Did I mention every single girl and mentor will get an opportunity to publish her work in a WriteGirl book? 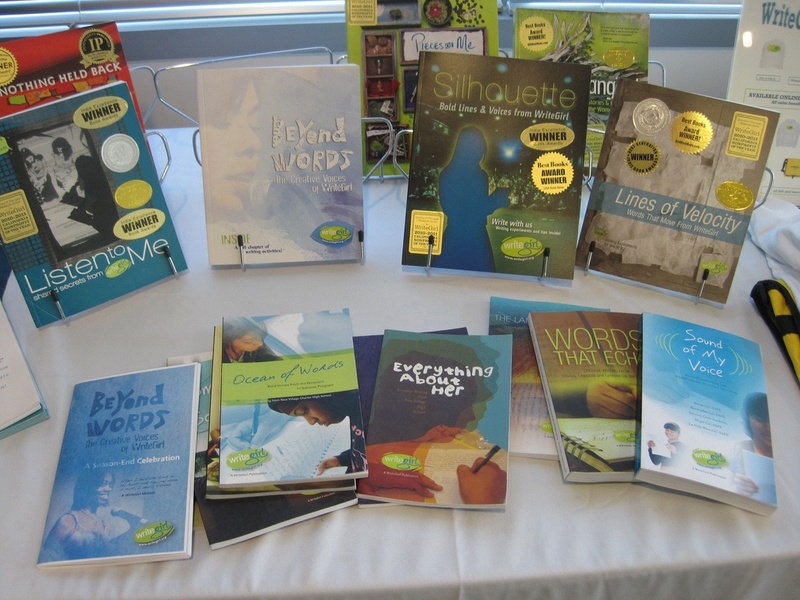 Incidentally, one of their recent publications, Silhouette: Bold Lines and Voices from WriteGirl has won seven book awards including a first place anthologies award from the National Indie Excellence Awards and a New York Book Festival award in the teenage category. What a dream. And did I mention that everything, the workshops and the mentoring are free? I know I did but it’s worth repeating since writing workshops are usually so expensive. What I wouldn’t have given for something likeWriteGirl back in my early writing years. But since my high school days are long past and regret is useless unless you act on it, I take pleasure in helping these young Angelenas with their literary future. As Ms.Taylor likes to say at the end of every WriteGirl meeting, “Never underestimate the power of a girl and her pen.” I like to think that goes for the girl in me and every other writing woman—past, present and future. Thank you Estela. I loved learning about Write Girl through you. What a great organization and what a cool way to encourage creativity and writing skills. I want to volunteer!! thank you for highlighting writegirl; what an outstanding organizatiion. adelante girls, and the women who mentor, adelante! and welcome estela! Estela, not only are you a wonderful writer, but you display a strong commitment to giving back to our community. Thank you for writing about this important way to help young women fulfill their potential. Gracias to all for your kind comments! I'm glad you liked the post and hope you can take some time to check out the WriteGirl website. And if any of you want to donate your time or money or both please let me know.